You know it is the start of summer when you fire up the grill for the first time. 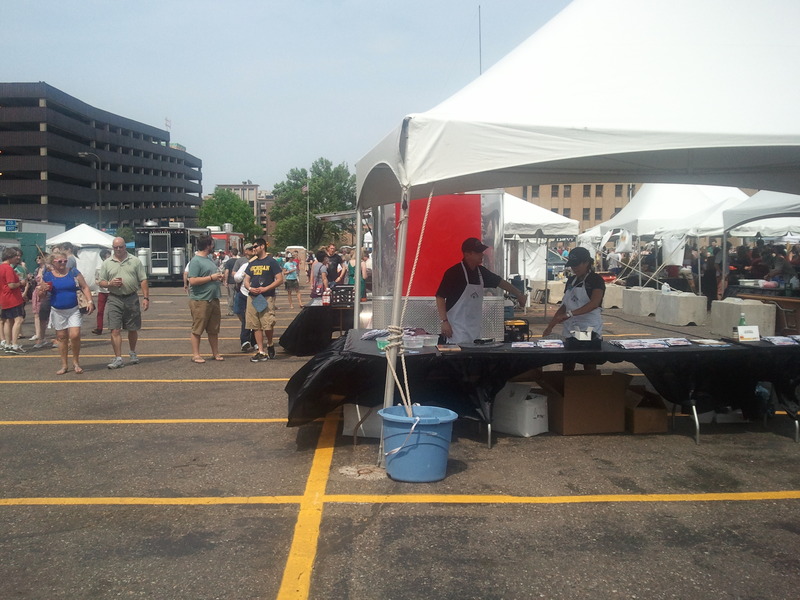 This past Saturday, I attended GrillFest which was put on by the lovely folks of Minnesota Monthly in downtown Minneapolis. This was the first time that they put on this event and hopefully it will not be the last because I think it will only grow in popularity over the years. Let me tell you, this was a great way to spend a leisurely Saturday afternoon, food, wine, beer, and interesting presenters. This event goes to benefit Minnesota Public Radio, so if you are a fan this is a great way to support the station and get to eat really great food at the same time. 1. The Burger from Macys. Holy Crap… that was a delicious burger. A pretzel bun with blue cheese, onions, burger perfectly cooked and a whole lot of love made this the best thing I ate that day. 2. The Jerk Chicken. Yum. I had a roommate once from Trinidad and she would have liked this jerk chicken. It gave that slow burn that you look for. Plus the guys serving it were awesome as well. They are new in the market and they were seeing if people other then themselves liked it. I did. 3. Surly. Need I say more. They had their Bitter on tap and well, I could have stood by that booth all day and hung out with the roller girls. 4. Captain Ken’s Baked Beans. Made locally, these beans are really great. You can even find them at Kowalski’s in the frozen food section. 5. Schell’s Brewery. Zommerfest. Thank goodness someone is making a summer beer without all that fruit in it. It is a lighter beer perfect for a hot day. 6. My South African friends with the Boerewors. I miss the wonderful meats that they have in South Africa and it was so nice to be brought back by the meat you were serving! Thanks to Von Hansen’s meat market for making it special for the event. I can’t wait to have my own Braai. 7. Local foods section. They had the Jelly’s that are delicious on meat. Also, a new simple syrup that was very good as well. I would have bought it if I didn’t have to lug it home and yes you should start to sell it in stores. It was good. 8. Tents in-case it started to rain. 9. Dr. BBQ. What a guy. I learned some helpful tips and I was entertained by his witty nature and jokes. Who knew to put in apple juice? Not this girl. 10. A speaker system that worked even though it was really windy. 11. Great Location. Easy to get from light rail to the parking lot as well as on bus routes. 1. Lack of seating and tables. COME ON. SERIOUSLY. Please supply these for your events. It is very uncomfortable to try and eat while holding your drink and multitude of other items. Its awkward and my satisfaction with the event would go up 100% if I could have set my drink on a table while I ate. 2. Better food trucks with more options. The food truck I ate at was not good. I tried it because I hadn’t had it before and the person taking orders was raving about the food. It was not a gyro, and that curry had curry powder that was not good. Hint hint: the food truck I ate at took all of my coupons and my partners coupons even though the sign said just one per item……. I thought I would be able to try one other truck as well. I think I may have been tricked…. Also, the food trucks could have done food that was not grilled more fresh food as a change from all the other food being served. There were a lot of shredded pork sandwiches. I want to eat what your food truck does really well. 3. Would have liked to see more more competitions. Just for fun. The hits definitely outweighed the misses at this event. You really can go wrong when you are eating good food and drinking good beer and wine. I will bring a few friends along next year to enjoy the event as well. Keep on keeping on Minnesota Monthly and if you ever need someone to help with your events…. hire me. because there is something in that BBQ sauce. If you were there as well, let me know what you think!